As the recent James Bond film proved, poker has hit the big time. Clubs dedicated to the gambling game are sprouting up all over the country. Cash in on the latest hot entertainment trend and host your very own poker party. The stereotypical poker player is male, old and the stereotypical club is dark, smoky and full of tension. The tension and excitement might be an accurate portrayal but these days there is no such thing as a typical poker player. Both men and women play professionally, and after being hailed as the latest and coolest game, players are getting younger. Now it is the perfect alternative to a boys or girls night out. Thankfully holding a poker party involves neither military precision nor organisational flair. The proposition is very simple - choose a night that you and your best friends are free, invite them round, get some drinks and simple food arranged and let the night unfold. It goes without saying that poker parties are best held at night. For some reason, it’s not a game generally suited to day-light. That's not to say that it wouldn't work well on a lazy summer afternoon with a BBQ in the background. However, a night-time atmosphere complements this game well and will go far to get everyone in the mood. Playing for kicks or playing for chips? If you are hell-bent on playing for cash then make sure that your guest's have the same desire. Some of them may be hardened gamblers who will be keen to go for high stakes. However, some guests may not be keen gamblers and their only flirtation with it has been a tame play on the slot machines. Make sure that the invites state whether you are playing for cash or for fun. Prepare your home for the party. In terms of decorations you can be as kitsch or as classy as you like. Go to a novelty party store and pick up some casino-themed items; plastic chips and garlands, coupled with a smart dress and cocktails, a few decorations will go a long way to evoke a Vegas theme. Don't be afraid to ask your friends to bring a bottle with them but don't neglect your host duties and rely on their generosity. Get a few bottles of wine, both white and red, plenty of beer and if you are holding a more sophisticated evening, ingredients to make the perfect martini. Food should be simple - no sit down feast is required! Think about putting on a mini-buffet. If you have heard of Texan 'Hold Em', an intense type of poker, think about adopting a Deep South theme with some "down-home" cooking. That means plenty of smoked meats and spicy sides. Mix together the mince, garlic, mustard, ketchup, egg, chilli, herbs and onion in a large bowl, ensuing that the mixture is evenly distributed. Divide into 8 patties and place under the grill, turning them once after 5-6 minutes. Preheat the over to 350f and line a tray with a sheet of foil and spray lightly with some oil. Cut the peppers in half, remove the seeds. In a bowl, combine the cheeses, mayonnaise and bacon and season. Spoon into the peppers. Place in the oven for about 25 minutes and serve whilst still hot. Cards - Have a couple of decks to spare; one that you can play with and one that can be shuffled in preparation for the next hand. Poker chips -The professionals will have clay composite poker chips in their personal collection. The amateur player needs only some plastic chips which are easy to source on the internet. Aim to supply each guest with up to 100 chips. There are other accessories available in the marketplace, including special tabletops that will go far to evoke a real feel of a casino. The party will only work if you have got your numbers right. If you are planning on inviting a large group of friends you cannot expect them to play on the same table. In this case, set up a mini-tournament with multiples tables on the go. As a general rule, there should be only 8-9 players on a table. The last thing for you to do is to practice your best poker face and make your guests leave without their shirts! 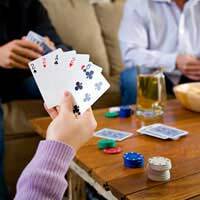 Poker parties can be very informal and are a new way of bringing together your close friends. Costs of putting on such a party are low but the entertainment value is definitely high.